Hey there bloggies! We’re back at it today for our last installment of Kids Eat right Month. I apologize in advance for not getting this on up on Friday as usual. Last week was pretty hectic and Friday morning we received notice that my mother-in-law suffered a mild stroke. NOT to worry, she is on the fast track to recovery and is on her way back home today. We’re all very grateful that she is doing better. Today we’re talking about Kid-Friendly Kitchen Tasks! I think it’s so important for children to get involved in creating healthy delicious meals. It gives them a sense of empowerment and their more likely to eat foods they’ve helped prepare. It’s also important to be sure they’re not feeling overwhelmed and, as always, safety first! My daughter just loves to cook and when we can, we’re happy to have her join. 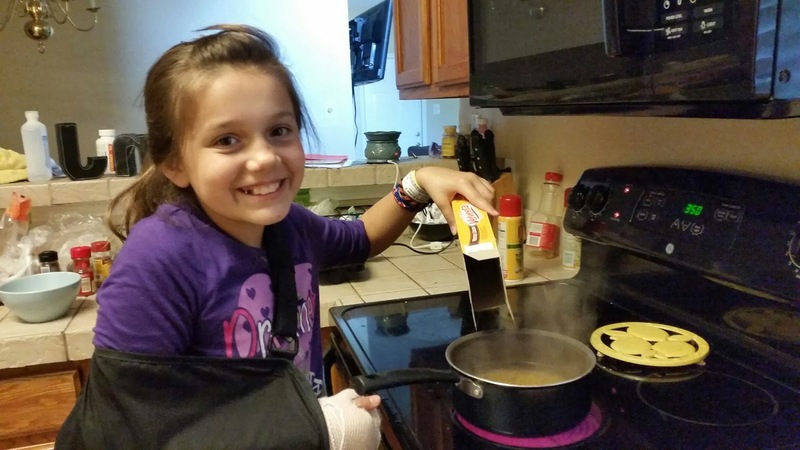 Last week she helped prepare dinner by cooking our favorite cheat side dish…Mac n Cheese! Typically she would much rather chop vegetables or help grill our meats but, as you can see, we have a fractured radius. She’s very excited about that oh-so-fashionable cast 😉 It only took two days back in school for her to have an accident. Oh the joys of back to school! Here is this weeks infographic from the Academy of Nutrition and Dietetics’ Kids Eat Right campaign. Be sure to visit their website for more information. Just click on the infographic below. How do you get your kids involved in preparing family meals? Share in the comments below!